Thanks to some recent price drops to various places in Asia, it's possible to find airfares from Toronto that allow you to visit multiple countries, and keep the price very reasonable. 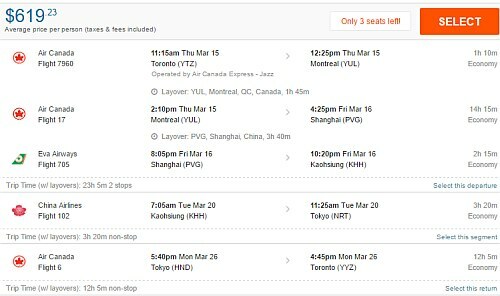 There's a 2-in-1 trip that allows you to fly from Toronto to Kaohsiung, Taiwan (spend time there) and then fly to Tokyo, Japan (spend time there) and fly home to Toronto - for a total of $619 CAD roundtrip. And there's a 3-in-1 trip that allows you to fly from Toronto to Seoul, South Korea (spend time there) and then fly to Kaohsiung, Taiwan (spend time there) and then fly to Tokyo, Japan (spend time there) and fly home to Toronto - for a total of $658 to $697 CAD roundtrip. * = non-stop flights the whole way! toronto, yyz, flight deals, air canada, asia, tokyo, japan, nrt, east asia, hnd, taiwan, cathay pacific, eva air, seoul, south korea, icn, kaohsiung and khh. 3 Responses to "2-in-1 and 3-in-1 trips (Toronto to Taiwan, Japan, South Korea) - $619 to $658 CAD roundtrip including taxes"
can this price still be had? i'm entering the same dates and destinations but coming up with $884. Unfortunately they've all gone up by a couple hundred dollars today. That's about the cheapest I've seen as well. I just checked now, the price doubled.